Redbone coonhounds are active, playful hunting dogs who are good with children and other dogs, although they might chase cats and smaller animals. The redbone coonhound is a versatile, adaptable, medium-sized hunter and believed to be the only coonhound with a solid color on the coat. They have great hunting, treeing and tracking abilities and will go after small and large game. Their ears are long, and the tail is usually held alert and upright just below the back line. The short, smooth coat is easy to maintain and is red, although white patches are possible. The nose is black, and the ears are round in shape, usually featuring a pleading expression. The dogs are between 21 an 27 inches tall, and they have a weight average of 50 to 70 pounds. Their average life expectancy is around 12 years but will vary with each individual dog. Red foxhounds came to the United States in the 1700s with immigrants from Scotland, which were later followed by red Irish foxhounds. Toward the end of the century hunters wanted dogs who were faster at tracking and treeing. They bred in Irish hounds and started developing the redbone coonhound breed. Once the hunters achieved the qualities they wanted by cross-breeding, they shifted their focus to the coat color. They selectively bred the dogs to achieve a solid red coat, then they focused on performance. The result of the selective breedings created dogs with natural treeing instincts, a distinct red coat, speed, agility, excellent swimming abilities and versatility. The redbone coonhound was added to the American Kennel Club’s Foundation Stock Service in 1995 and was designated to the hound group in 2009. Redbone coonhounds were bred to hunt, track and tree small and large animals, and they are great racoon hunters. They are also companion pets who may participate in dog shows, agility, obedience, night hunts, water races, field trials and tracking. 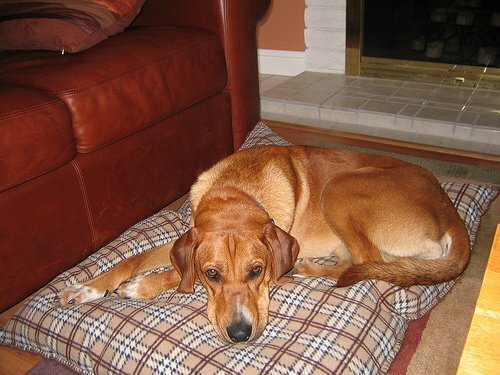 The even-tempered and affectionate redbone has a strong desire to please and prefers to be close to family members. They can be trained, and training and obedience should start as soon as possible. Keep training fun and interesting using positive reinforcement; redbones can have short attention spans. This breed gets along good with children and other dogs, but they may give chase after cats and other pets. Drooling may be heavy but will vary with each individual dog. Redbones are versatile and agile on a variety of terrains and in different types of weather, making them great companions for outdoor adventure. They are mostly inactive indoors but still have a high energy level, so they should be taken on daily walks and/or jogs to help them expel energy. A large, fenced yard would be ideal, but they can do well in apartments if sufficiently exercised daily. Because of the dog’s strong desire to chase or tree animals or follow a scent, they should be kept on a leash or exercised in a secure area when outdoors. The short, smooth coat can be maintained with weekly brushing, and bathing can be done as needed. Shedding is minimal for this breed. Regular maintenance of the ears, nails and teeth should be done regularly. For dogs who have active hunting roles, they should be checked thoroughly when returning from a hunt for insects and debris on the coat, paws or in the ears. The redbone coonhound is a very healthy breed. The only common ailments of note are hip issues (dysplasia) and progressive retinal atrophy (PRA). Is the Redbone Coonhound the Right Dog for You? 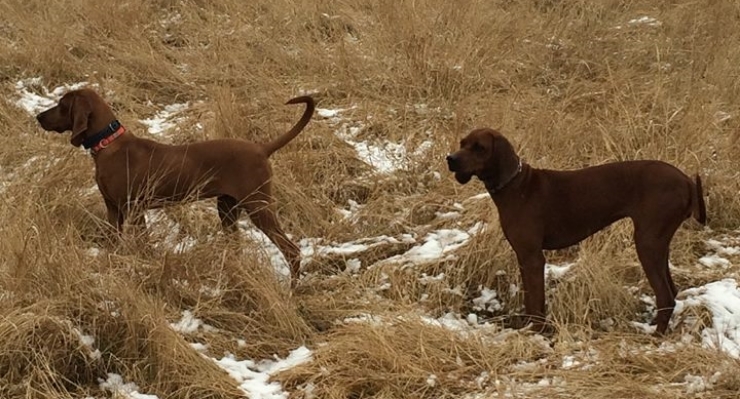 Redbone coonhounds are hunters and trackers by nature, but they are also affectionate companion pets. They are good with children and other dogs but may give chase after cats and smaller animals. They have a high energy level and need regular exercise. They enjoy the outdoors, swimming, meeting other dogs and are very playful. Redbones can do well in apartments with regular, outdoor exercise. 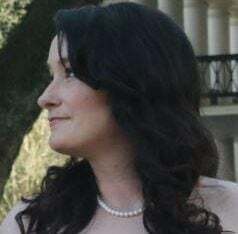 They do not shed much and need minimal grooming, although dogs who hunt and track should be checked for insects and debris when returning indoors. They have very few health issues and live 12 years or longer. If you have an active lifestyle, consider a redbone coonhound for your next companion. Start here to see if a redbone coonhound is available near you. There are also several dogs, purebred and mixed, that are currently available for adoption around the country. For additional results, check the Petfinder website. If you contact a breeder, always view their facilities and ask to see the parents of the dog you are interested in buying or adopting. Since this breed has a history of hip dysplasia, any responsible breeder should be able to provide health clearances or reports on either the dog or the dog’s parents. Never be afraid to ask questions; ethical breeders should welcome them and also ask you several questions about your lifestyle and home before allowing you to take a dog home.